Cape Agricultural Products supplies many different items to assist nurserymen and farmers when it comes to training and trellising their crops or plants. These items help the grower to either train plants and crops, or secure the plants to supports as protection against wind damage and other environmental factors. Some of the trellising and training aids that we supply are listed below, in no specific order. 1. Tying young fruit trees to new trellis systems. 2. Securing plants that have been trained as standards, to their stakes. 3. 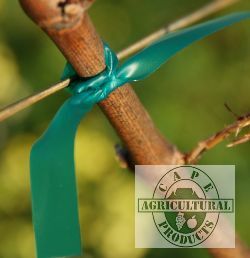 In the wine industry it is often used to "tie off" older vines, to the cordon wire. 4. In landscaping used to secure plants to staking systems for protection against damage from wind. Available in rolls of 100 metres, in green or black. 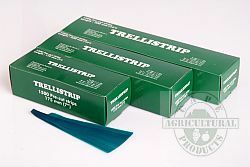 Trellistrip tying tape is an excellent tape for tying young plants. Used extensively in vineyards and fruit orchards in South Africa, as well as other countries around the world. The tape can either be supplied in pre-cut strips in boxes or on rolls. 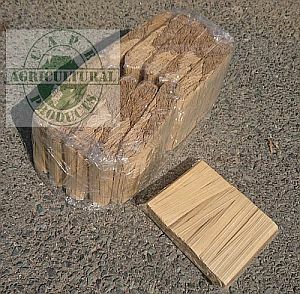 Pre-cut strips are packed 1500 per box in lengths of 175 / 250 / 300mm. Rolls are also available in 12mm or 25mm wide, in lengths of 25 or 50 metres. 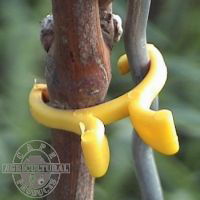 These Vine Clips are used extensively in the vineyards of South Africa to attach young vines to the cordon wires during the 1st two years of growth. 1. Hold the vine and wire together with one hand. 2. 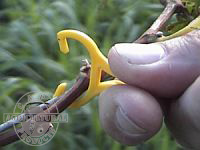 Press down on the "legs" of the clip with your thumb and forefinger of the other hand, opening it in the process, and place over the vine/wire. Click here to see vine clips in use. Packed in bags of 10 000 clips. Normally produced in yellow but other colours are available on request. 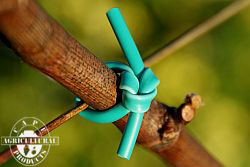 Paper twisties are used extensively in the table grape industry in South Africa for attaching new shoots to training wires. Also used in the wine industry for young vines, as well as in nurseries for securing young plants. 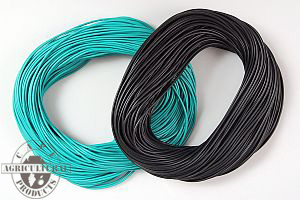 The twisties are 100mm long with a thin wire to ensure secure attachment. The paper and wire are both biodegradeable. Packed in 1000's and also in bulk packs of 10 x 1000's as seen here.